Are you familiar with the Half-Shell Heroes? Back in 2015, Nickelodeon released an hour-long special, Blast from the Past, featuring the green machines in an adorable art style. Although the lengthy episode is aimed toward younger kids, the lighthearted, very silly humor is still entertaining for the older fan base. I'm pretty sure this special was created solely for merchandising. But, it's hard to care. Cowabunga has never been so cute. The existence of the Half-Shell Heroes special along with all its merchandise means there's another opportunity for holiday-inspired creations. Is this snow globe something festive for us fans to swoon over? It embraces the winter season, but also treads very lightly on any Christmas appeal. Santa must've had his best elves on the job for the Half-Shell Heroes snow globe. The craftsmanship is beautiful. It's solid, made with strong material and features a real glass dome. Crank the bottom to enjoy a few music notes too. A nice touch, but I was hoping for a TMNT theme song. I guess we'll have to settle with the standard lullaby. This globe is no cheap kids toy with gimmicks. It's the real deal and would look natural in a collection of high end snow globes. But, its elegance might be its ultimate downfall. The original TMNT snow globes I had as a kid have not aged well. Their cheap plastic has faded and the water has severely evaporated. It's safe to say the holiday cheer they once boasted so brightly in the 90s is now dead. I've been waiting for a new TMNT snow globe for decades. That's why I was so excited to find this Half-Shell Heroes entry. It's built very well and plays music - 2 key features not found on my TMNT snow globes from the 90s. I want to love the Half-Shell Heroes snow globe, but unfortunately it's just okay. All of its bells and whistles can't hide lack of Christmas inside the snowy dome. I want Turtles dressed as Santa, ninja snowmen, and candy cane weapons! 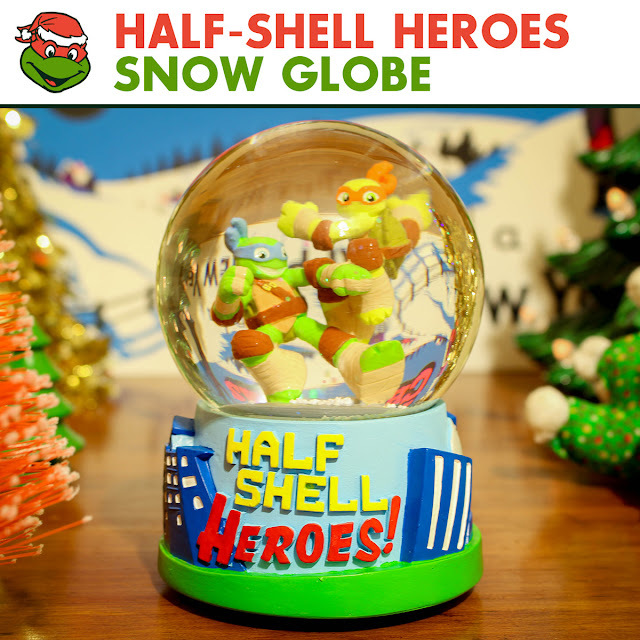 The Half-Shell Heroes snow globe is a worthy entry, but Santa's best elves need to give it another go. 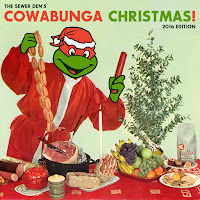 Check back for more holiday hijinks all month during The Sewer Den's Cowabunga Christmas! I've got this rad room filled with TMNT treasures called The Sewer Den. A museum of memories, a collection of cowabunga.